ENJOY OUR SPECIAL OFFER: Buy One Get One Free! 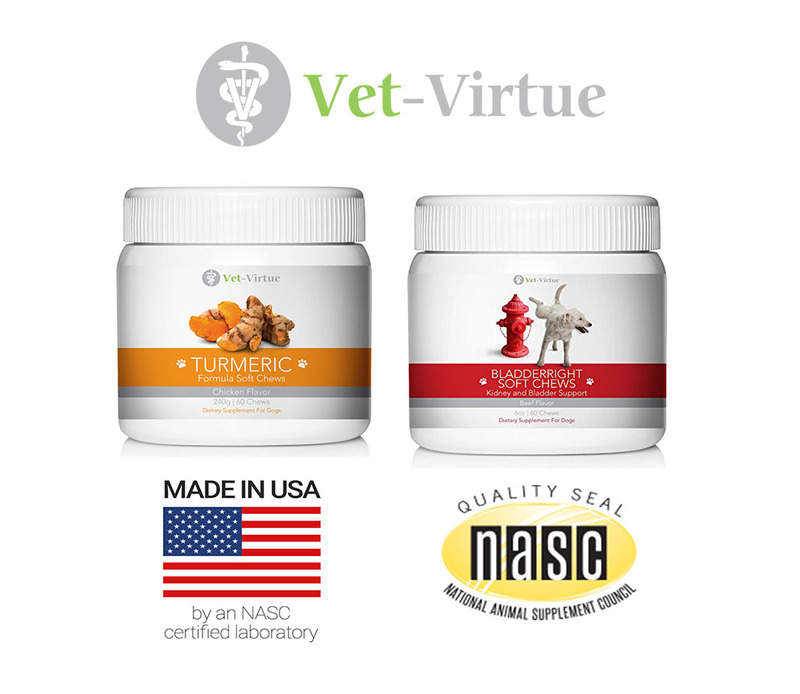 Vet-Virtue supplements are delicious treats made right here in the USA at our National Animal Supplement Council quality-inspected laboratory. 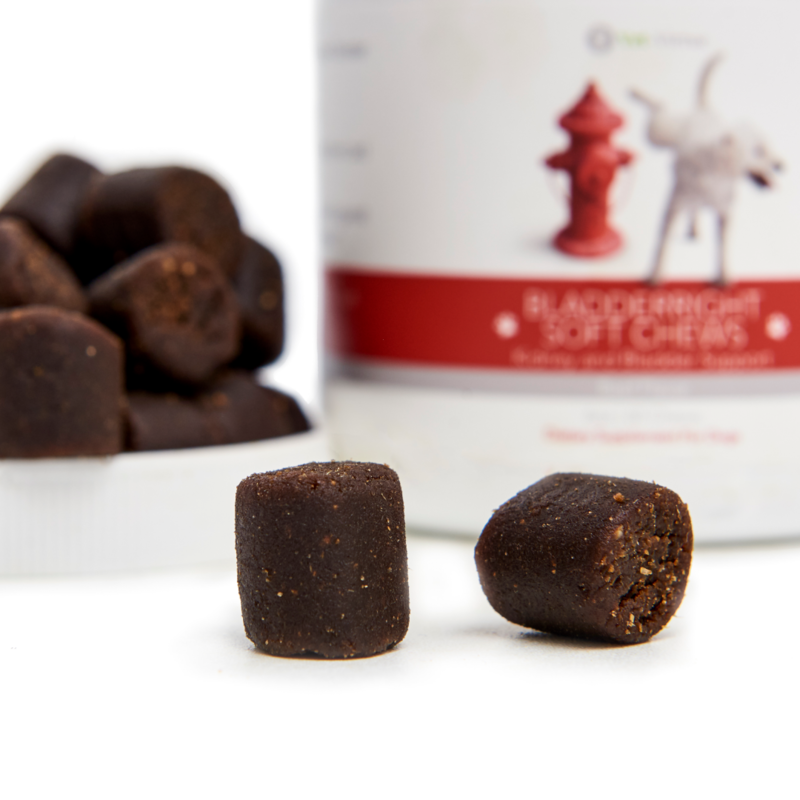 Today, use the code "HDCCHEWS" to buy the Bladder Right Soft Chews and get a FREE bottle of the Turmeric Soft Chews! Simply add both to your cart and use the code at Amazon check-out! Learn about their amazing health benefits below! We Are Keeping Your Pup as Strong As Their Bond With You! Scientifically Designed, Natural Supplement Treats for Your Furry Child! Coating the bacteria so it can't attach itself to the walls of your dog's digestive system so the infection can be washed away! Reducing Inflammation and damage caused by the infection; bringing relief to your pup sooner rather than later! Giving a boost to your furry friend's immune system so that once the infection is gone; it stays gone. Delicious beef flavor that dogs love! 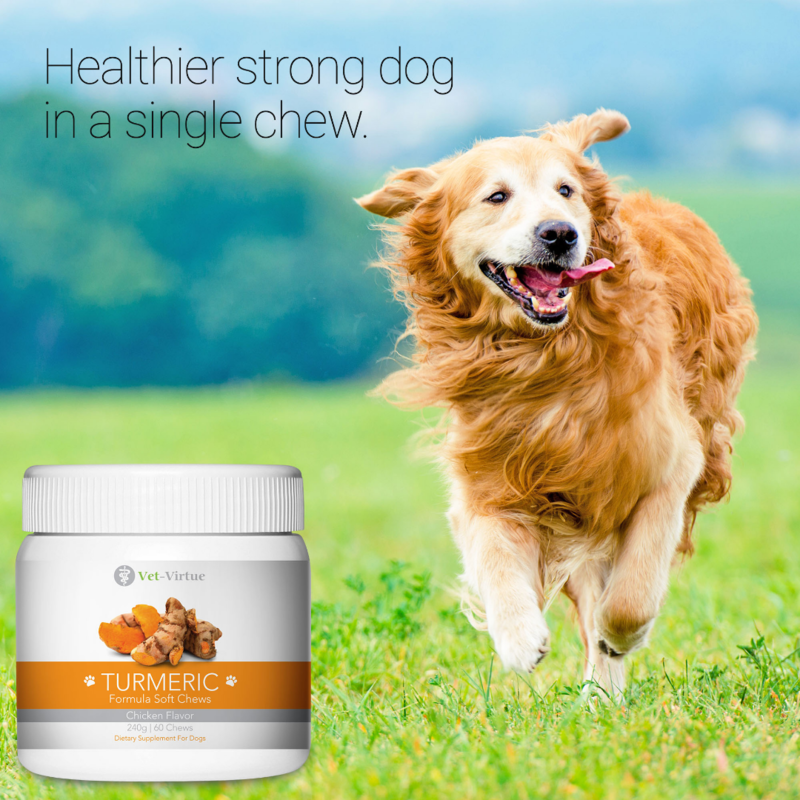 These delicious chicken flavored turmeric formula chews act as a natural anti-inflammatory due to the curcumin contents. Short-term inflammation actually plays a great roll in healing and protecting the body from bacteria that would otherwise easily wreak havoc. However, it turns out that you CAN have to much of a good thing! "My dog loves these!!! She is a 10yr old (80 lb) black lab, so as expected, she experiences a lot of joint inflammation. She also has digestive issues. These soft chews work great for both of these problems! My old girl absolutely loves these, she gets one every morning (it is the best pat of her day!). I love how they are made in the USA! I highly recommend! Thanks Vet-Virtue!" "My 14+ year old Border Collie has arthritis in his hips and front legs and suffered a stroke a couple months ago. I have been feeding him a grain free food, and giving glucosamine to help his mobility. It has really helped, but i wanted to do more. I started giving him these tumeric chews (which he REALLY likes and he's not too fond of treats) and his movement is even better. He's actually instigating play time with my other border. It's wonderful to see. He is getting up much stronger, and more steady. So glad to see. It wasn't his time to go yet, and i'm grateful he is feeling good. Looks to be feeling really good! We will continue to use this product and plan on starting my younger old dogs on it as well. Thank you for a great product!" "I love the results!! And so does my 80 pound American Bulldog. She is 9 and has been slowing down. The vet said she has athritis in her back leg and in her spine. I already give her glucosamine and decided to add this to her daily diet. She has a sensitive stomach so I started with one. She gobbled it right up. I will say, she started passing the most horrific gas!!! After about 2 weeks, the gas slowed down so I up'ed it to two pills. Honestly, she was like a new dog! She got up quicker, less limping and a lot more energy. So much so, she started acting like she was two again, racing around the yard like a crazy women and tore her back ligament. These pills were like the fountain of youth for my dog. I also like that fact that they are made in the States. I am now purchasing my third containers of these." "Our white shepherd/husky mix came into our lives as a rescue Aug. 2008. At the tender age of 1 1/2 she already had issues with her front left leg and her hips (the vet found even under anesthesia her hips wouldn't relax). About 2 1/2 months ago she couldn't move without yelping in pain. It broke my heart, so I started her on low-dose aspirin and ordered Turmeric for dogs. In only 2 days time the change in her was evident. Not only did she stop yelping, she started to run again!!! We now make this a twice a day treat for her and she loves it!!!" Shop with us today and see the Vet-Virtue difference! Use "HDCCHEWS" at checkout! You get your money back! There’s absolutely no-risk in giving it a try. No questions asked, you can get your money back! ENJOY OUR SPECIAL OFFER; USE "HDCCHEWS" AT CHECKOUT!